Volks Buster: Elemental VW Show #8 Spots! Elemental VW Show #8 Spots! 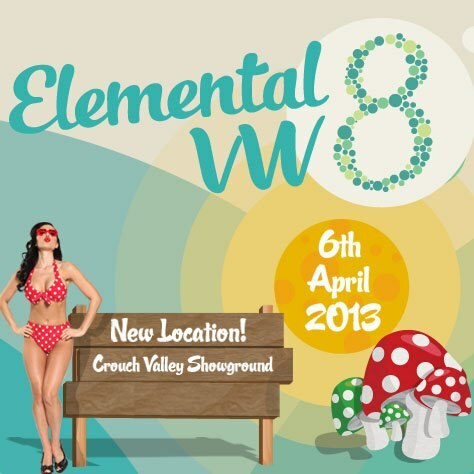 Elemental VW Show #8 has been announced for next year on the weekend of 5th - 6th of April, the event has been moved from it's long standing location of the Mountfitchet Mathematics and Computing College as due to it's popularity the 2012 show had to have the day parking in another field off site. The organiser of the show Technohippy wasn't happy with this as he felt that it's better to have everything on site. The new bigger location is the Crouch Valley Showground, Just off A127 on the A1245 Essex, the 14 acre site will have plenty of room for all the usual Elemental goodness such as show n shine, club displays, kids entertainments with Raggedy Jack the Story Teller, Cosmo 4 Kids and new for 2013 a dedicated kids festival area, as well as live bands such as Hobo Jones & the Junkyard Dogs, Deferred Success, Abdoujaparov, Gaz Brookfield and The Fundamentals. As always the show is non profit making with all proceeds going to Essex Air Ambulance.